I am doing 1/4 size so I made 25 of these Double Diamond blocks. I used the stitch and flip method so now I have many small bonus triangles. Clue 3 was pretty simple except that I did not measure after I had sewn any of the strips together (and of course my seam allowance was set extra scant for something else I was sewing) so everything was off by the time I had the four 2inch strips together. Lots of re-sewing ensued! I am doing Christmas colors for the Grand Illusion Mystery. I did not have enough scraps in Bonnie's colors so I decided to go with this. I am using red for pink, light green for turquoise, a very dark green for her green. I'm using 2 yellows that are very similar as my yellow, this one black snowflake and my neutral is a very light grayish-whiteish batik, and possibly other bits. This will be my third time doing a Bonnie mystery, but I only have one quilt top to show for it. I completed the Celtic Solstice top a couple of weeks ago. 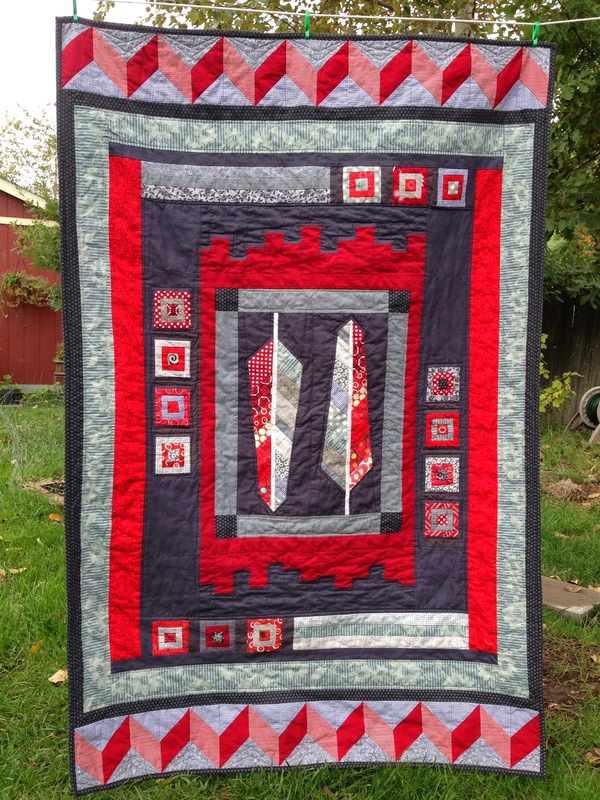 Check out what everyone else is making on Quiltville blog link up. I love these, tho I'd love to make more, I should stay with these, add a border and have it done by this Christmas. 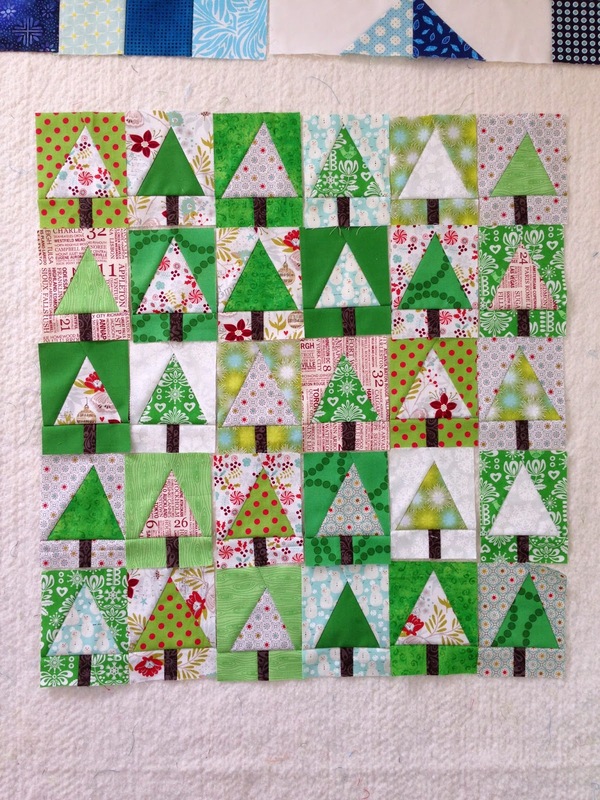 I saw these trees on Diary of a Quilter. She has great tutorials. The pile of 2 patches was getting larger so I started laying them out on the design wall. Next will be to sew them in to 4 patches and on from there. I'll be using these as leader/ender for the Grand Illusion mystery quilt by Bonnie Hunter. I'm running low on 2.5" colored squares, however. Need to check the stash to find some I haven't cut into strips yet, there are several for sure. I haven't decided how many of each fabric I want in it. There are a bunch that have 2 and I could make it much bigger quicker if I did 3 or 4 of each fabric, but I also like the idea of 'one of each fabric'. So who knows. I've had these blocks around for months. I have more of the 16 patches, about 10, but this is all the X blocks I have. Its made from 3 1/2 in. 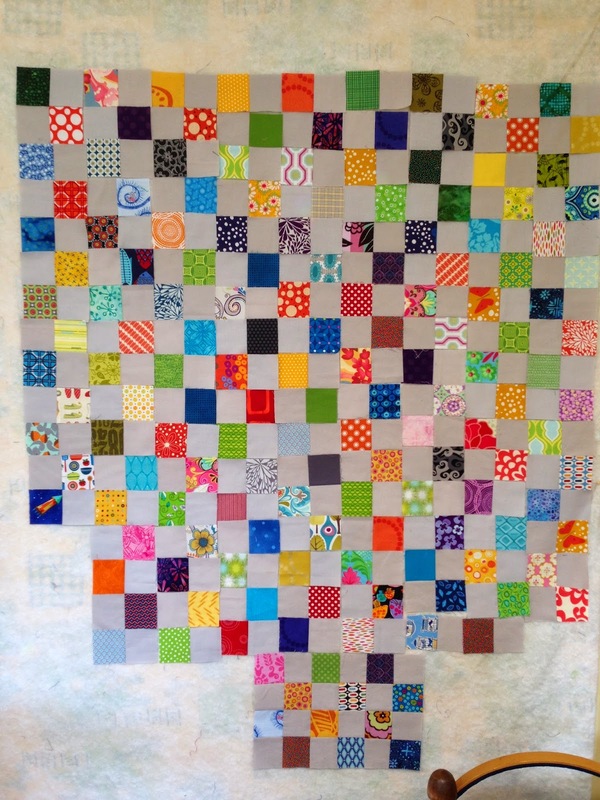 unfinished squares, and it already fills my design board. I guess I was thinking I'd make a queen size when I started. 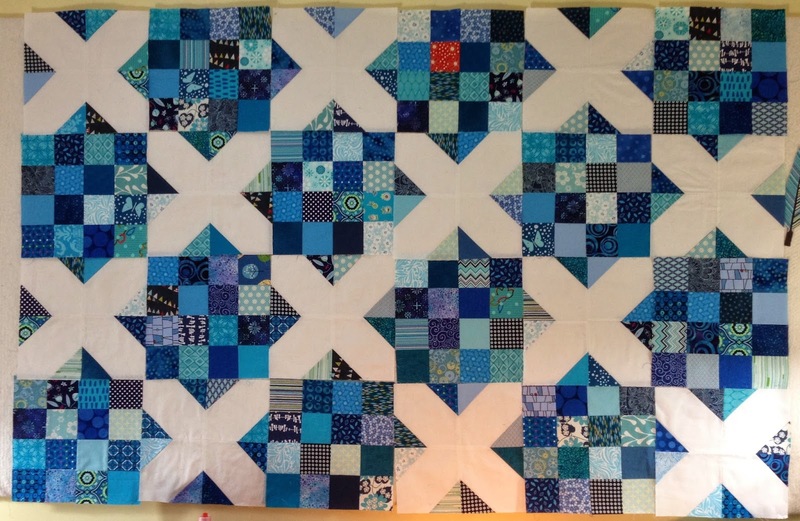 Also I miscalculated and cut about 100 more blue squares than I'd need for even a king size. 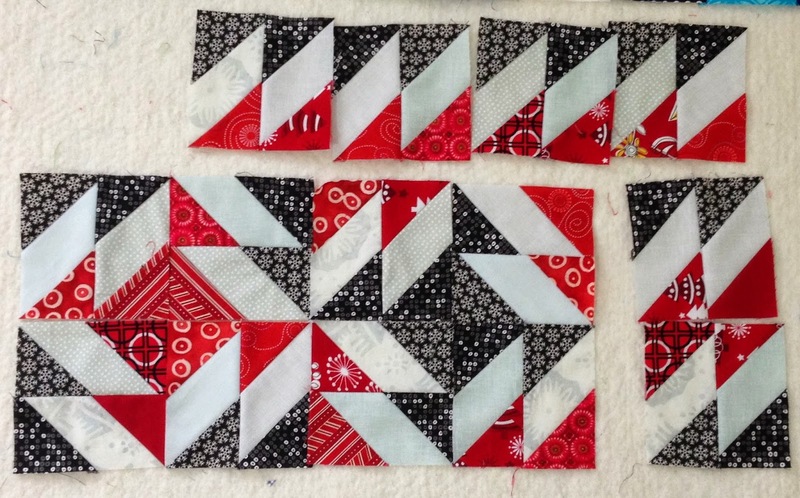 There will very likely be more quilts with these squares! 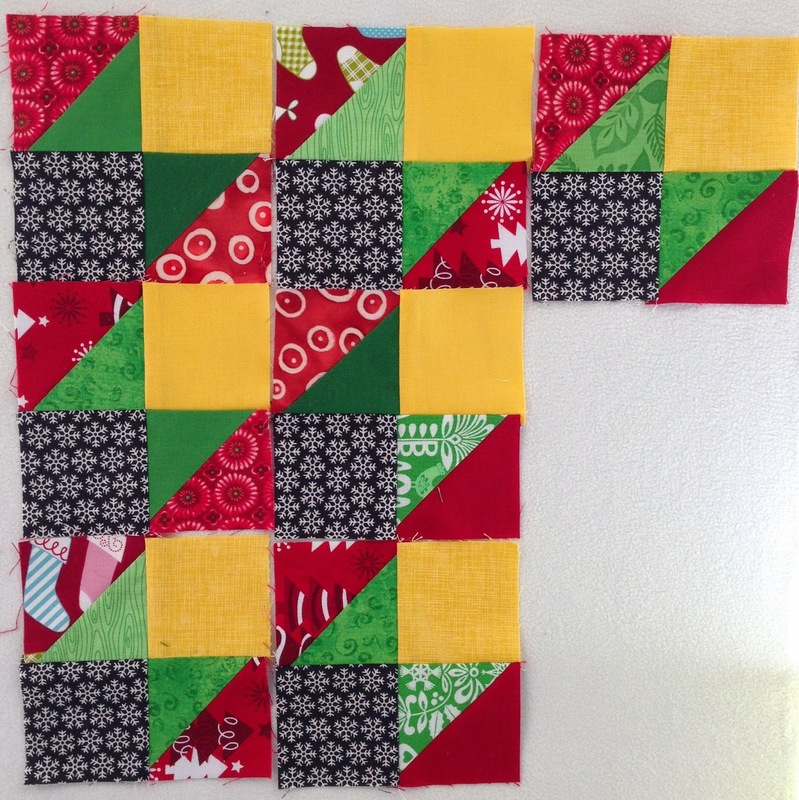 I used 53 different fabrics in all the blocks I have. I'd love to get this finished but am intimidated by the size. Ruby is feeling it in style! I had a lot fun making this quilt. I gave it to my son for his 18th birthday. The feathers are from Anna Marie Horner's free pattern. While I made the feathers with small strips I also made some 3" log cabin blocks. 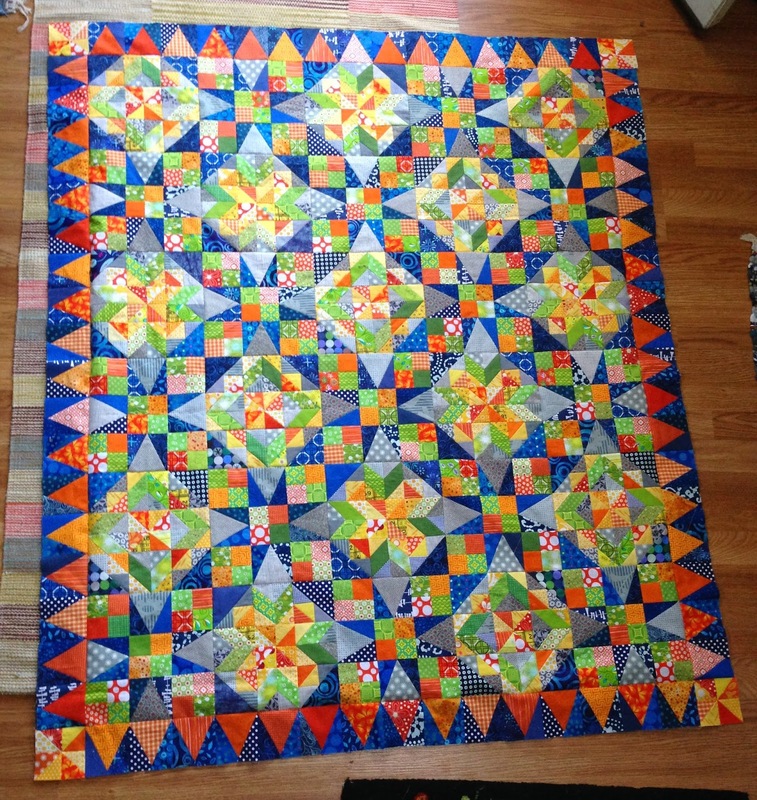 I didn't have a plan for the quilt, I just started with the feathers and worked rows around. Putting it up on the design wall at each stage was great to choose the layout for the next row. 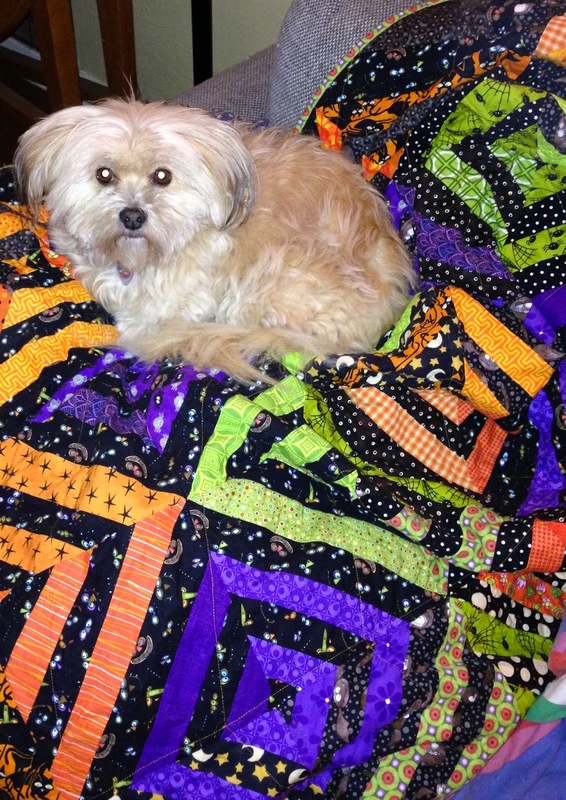 Make sure to check out the great quilts at Bloggers Quilt Festival at Amy's Creative Side blog. 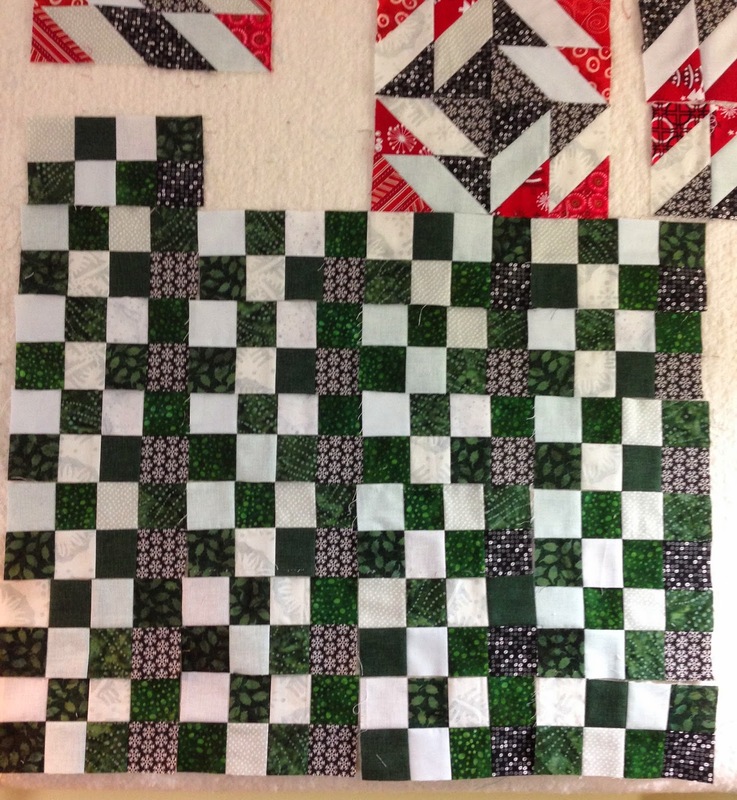 I am trying to finish my reduced version of Celtic Solstice before Bonnie Hunter starts this years mystery quilt. I am going to add a solid blue border and then call it done. I love the pattern but I would have chosen my fabrics differently if I had known the finished design. I would love to make this again in a whole new colorway. Hello! I live in Oregon with my husband, teenager and pets. I make quilts in the corner of my kitchen, where in 2011 I squeezed in a sewing machine and have since added way too much fabric.